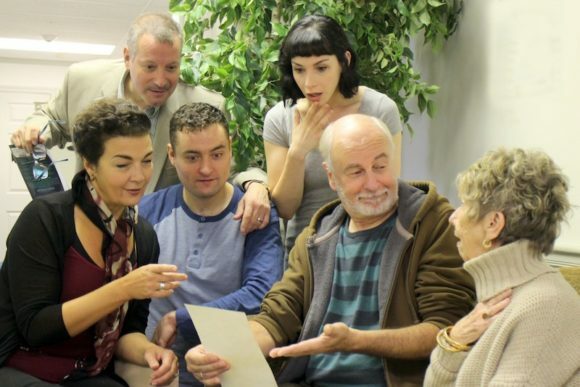 Hard at work in a rehearsal for ‘The Game’s Afoot’ are, from left to right, Katrina Ferguson, Michael Iannucci, Molly Densmore, Erik Bloomquist, Craig McDonald and Maggie McGlone Jennings. Photos by Anne Hudson. IVORYTON – On Wednesday, Nov. 1, the Ivoryton Playhouse continues the Halloween season with a murderously funny thriller set in William Gillette’s Connecticut Castle – Ken Ludwig’s The Game’s Afoot. It is December 1936 and Broadway star William Gillette, admired the world over for his theatrical portrayal of Sherlock Holmes, has invited his fellow cast-members to his Connecticut castle for a weekend of revelry. But when one of the guests is stabbed to death, the festivities in this isolated house of tricks and mirrors quickly turn dangerous. Then it’s up to Gillette himself, as he assumes the persona of his beloved Holmes, to track down the killer before the next victim appears. In the vein of the best “whodunit” murder mysteries, the plot takes many twists and turns. The dialogue is witty and face-paced; there’s suspense within the laughter and even when you think you’ve figured out who the bad guy is, you will start to question yourself when the plot takes an unexpected twist. An intense moment during a rehearsal for Victoria Bundonis and Craig McDonald. The Game’s Afoot is directed by Playhouse Artistic Director Jacqueline Hubbard and features Ivoryton favorites Erik Bloomquist, Victoria Bundonis*, Katrina Ferguson*, Michael Iannucci*, Maggie McGlone Jennings and Beverley J. Taylor, as well as Craig McDonald*, making his Playhouse debut as William Gillette and Molly Densmore* as the beautiful Aggie. Set design is by Daniel Nischan, lighting design by Marcus Abbott, sound by Tate R. Burmeister and costume design by Kathleen T. Gephart. 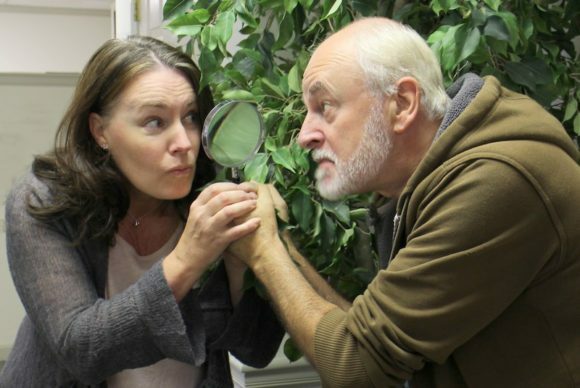 The Game’s Afoot opens at the Ivoryton Playhouse runs through Nov. 19. Performance times are Wednesday and Sunday matinees at 2 p.m. Evening performances are Wednesday and Thursday at 7:30 p.m., Friday and Saturday at 8 p.m.
Tickets are $50 for adults; $45 for seniors; $22 for students and $17 for children and are available by calling the Playhouse box office at 860-767-7318 or by visiting our website at www.ivorytonplayhouse.org (Group rates are available by calling the box office for information.) The Playhouse is located at 103 Main Street in Ivoryton.